The Dominion® KX III User Station is a standalone appliance for high performance IP access to servers connected to Dominion® KX III switches. It can sit on a desk, be mounted in a standard 19” rack, or VESA-mounted on the back of a monitor. . 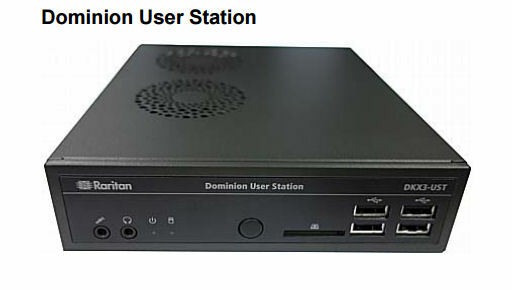 The Dominion® KX III User Station is a standalone appliance for high performance IP access to servers connected to Dominion® KX III switches. It can sit on a desk, be mounted in a standard 19” rack, or VESA-mounted on the back of a monitor. Deploy it using standard Cat5 cabling and Ethernet/IP technology. Simultaneously access, view, and control multiple servers, spread across single or dual monitors. The User Station can replace outdated analog matrix switches, replace/supplement expensive, inflexible broadcast systems or be deployed anywhere hassle-free IP access is needed. The Dominion KX III User Station is a self-contained appliance that provides users with high-performance IP access to remote servers and workstations connected to the KX III KVM-over-IP switches. Perfect for labs, studios, control rooms, offices and data centers, the user station is easy to deploy using standard Cat5/6 cabling and Ethernet/IP technology. The User Station has a powerful desktop user interface that is flexible and productive. Supporting multiple KVM-over-IP sessions over single or dual monitors, users can simultaneously access, view and control 8 or more servers. The Dominion User Station (DKX3-UST) is designed to access servers and computer devices connected to Dominion KX III KVM switches from customer LAN/WAN networks. ALL KX III KVM switches are supported. See information on required KX III KVM switches not included. You can store the IP addresses of multiple KX III KVM switches on the Dominion User Station so that you can remotely access any IT device connected to these KVM switches with only one click. • Two 1080p streaming video sessions at 30 FPS. • Ultra-fast connections and sub-second switching with the non-blocking DKX3-808 model. • Supports VGA, DVI, HDMI & DisplayPort video. • Self-contained, low maintenance appliance. • Supports single or dual monitors. • 8 or more simultaneous IP connections. • Full Screen mode (with hidden toolbar). • Favorites and hot-key switching. • Virtual media and USB audio. • Flexible dual LAN or WAN access. • Use corporate and/or separate LAN. • Connects with inexpensive Cat5 cabling. • Access hundreds of servers and devices. • PC/Laptop access also available.